He certainly is. And a gentleman would never allow a skeleton to light their own cigarette. Very dashing. He’s in a lot of wonderfully bad movies. Great post! 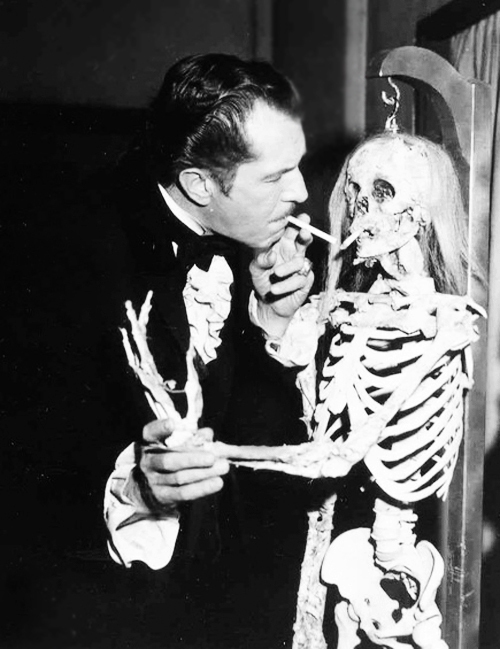 …But Having A Smoke With A Skeleton SCREAMED Reblog!!! He was in a number of wonderfully bad movies because the directors were intelligent enough to see the his ability to elevate small productions. he was accused of over acting but that intensity and passion for each role allowed people to do what is essential to enjoy a fictional scenario on film,,,, and that is to suspend our disbelief for the duration of the film. to allow it a sense of reality. I have the fondest of feelings for the man not because i was his friend or even an acquaintance, but because he none the less was known by us all through his work, and even more importantly his class. He was truly legendary, and I think rather underappreciated. It is amazing how a presence like that can elevate a mediocre production to something memorable. I would have loved to have just sat down with Vincent Price for coffee or something. As usual, Mme. Weebles, you make an excellent point. He is on my top 10 list for a living/dead dinner party. Can you help me regurgitate my iPhone? Try watching the spider bite tutorial. If you don’t love this … I can’t help you. I think this would be an excellent litmus test for allowability into polite society.